Trough my preparation for OCA 1Z0-042 exam, it is essential to install and manage database, so I decided to create a blog about it. First keep in mind that 10g requires at least 512MB of RAM 1.5 + 1GB of disc space. Before you start the installation you need to review the installation guide. 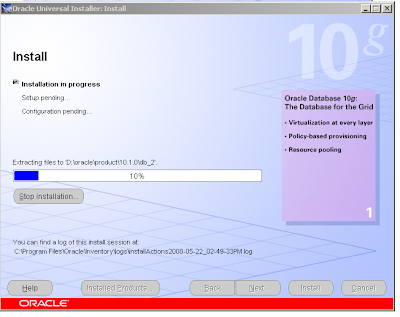 Download the installation source from Oracle web page (www.oracle.com).When download is complete unpack it (10g_win32_db.zip) and change your working directory to: 10g_win32_db\Disk1, by double clicking on setup.exe file you will start the Oracle Universal Installer. 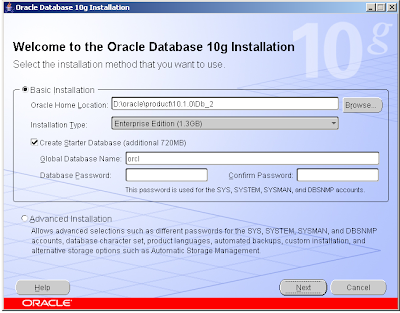 Oracle provides a simplified installation protocol, by leaving the Basic Installation button checked you will use that, but I’ll use the advanced so click on radio button next to Advanced Installation and click on next button. Now you can decide which kind of installation you want to do, because I’m learning from book in which the enterprise edition is preferred, click on radio button next to Enterprise Edition and click next. 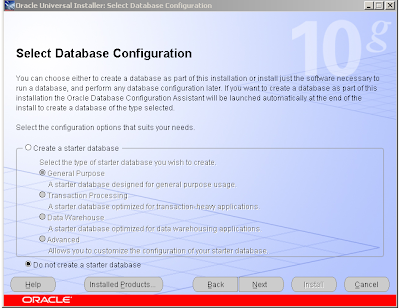 Later I’ll show you how to create a database with other Oracle tool (DBCA Database Configuration Assistant), so now select the Do not create a starter database radio button, and click on next button. 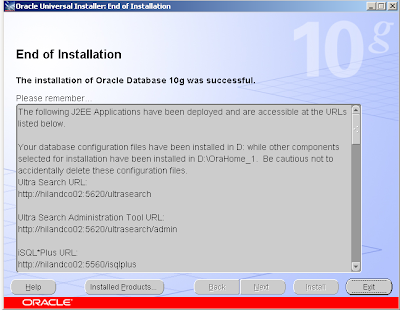 A product Summary appears, by clicking on Install button the Oracle Universal Installer will begin the actual installation. Keep eye on window so you can see what’s happening during installation. Note 1: hilandco02 represents my machine, on your it will be different. Note 2: because there is only the infrastructure but not any db is installed these link will only work when you create a db. Click on exit and confirm that you really want to exit.